Which is your favorite from this Baselworld 2019 Bell & Ross releases? Thread: Which is your favorite from this Baselworld 2019 Bell & Ross releases? I'm stoked to see these pieces! Thought I can do a round up of what there are for this year! The other collections to follow below! 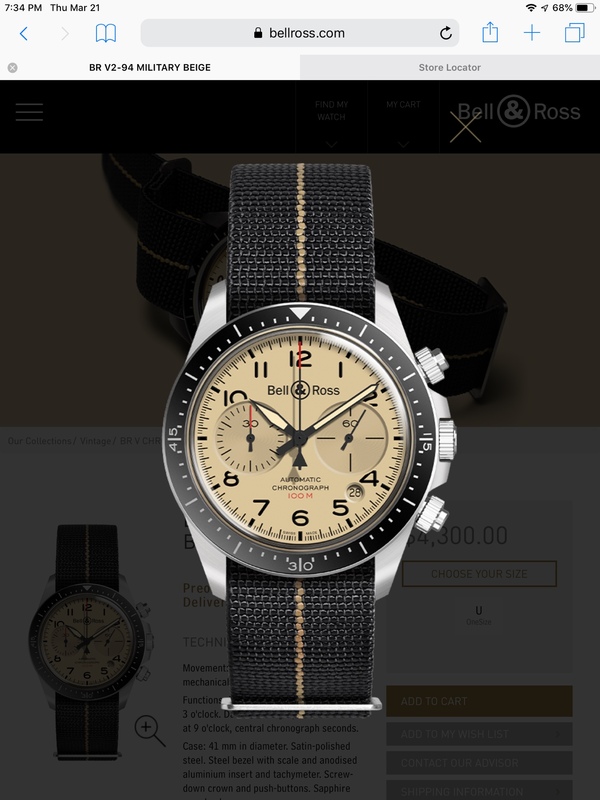 Re: Which is your favorite from this Baselworld 2019 Bell & Ross releases? Love Love Love the BRV2-92 Military Beige. Followed closely by the BR03 RS19 which I tied on in the Melbourne Boutique which already had all the RS19 models on display. I really like the new dial with the rounded minute counter and sub second. BR03-92 MA-1 for me. I know a BR when I see a black square watch. rigid yet fluid design. The RS19s are too much for my tasye but the rest of them I'm a fan. Nice looking BR03 in blue and the military beige looks great too. Solid showing for B&R this year. The Bellytanker Bronze is a stunning piece, only I'm a bit underwhelmed by the black leather strap (is it a dress watch or a sports watch). The MA-1 is cool and will be well received, however the design is a sandwich dial version of BR 03-92 PVD Orange from 2007 (but with matching color date!). I applaud the reversible strap, brilliant and simple. The BR03-92 Diver Bronze Green is done in good taste. The RS19 collection is a miss. I can appreciate B&R expanding into auto racing, but the design cohesiveness is all over the place, and the watches look garish. I beg to differ on the MA-1 being a sandwich version of the BR03-92 pvd orange. The entire case is khaki green ceramic, not the standard black ceramic. This khaki green ceramic differs to that of the previous green ceramic BR03 version. Means that the case was entirely made from scratch without reusing of the case. Nice spot on the similar color date too! Which is your favorite 9900 Speedmaster from 2017? Hands-on Railmaster mania at Baselworld ?.which is your favorite? Which is your favorite "luxury" diver? What's your favorite from Basel '06? Which is your favorite Clive Cussler/Dirk Pitt book?